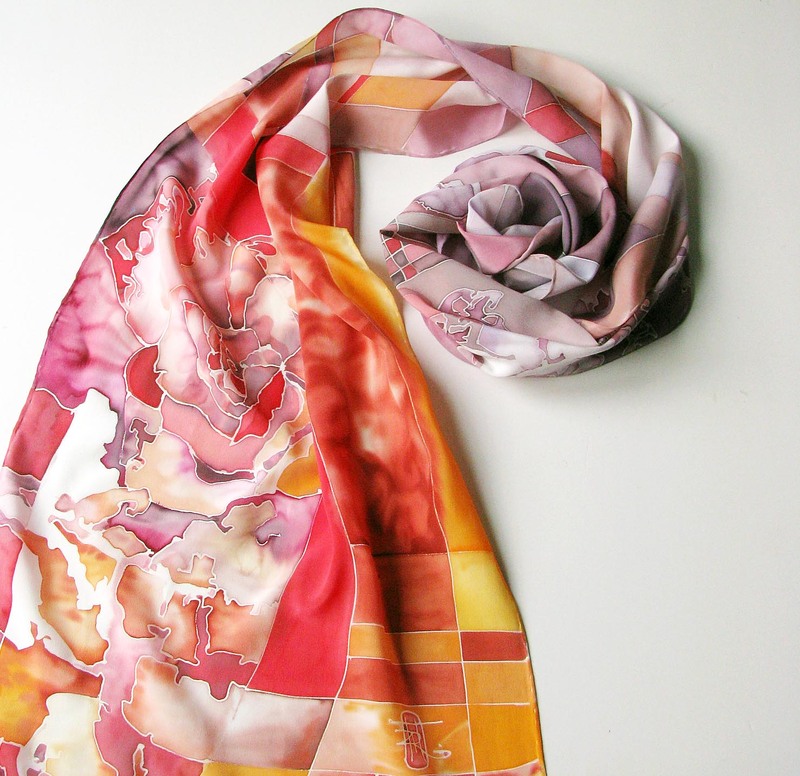 Today I have the great pleasure of introducing you to a fellow silk artist Zita. Her shop is full of color, creative photography and life! Enjoy her story! My name is Zita Rutkauskiene, I am from Lithuania. I am a mother of two, a grandmother of one, a wife and a cat owner. I live with my husband Bronius, who is also an artist. We have a cat Knutas who enjoys art and chewing my paintbrushes. I originally trained to be an artist-restorer and worked in many churches restoring their altar paintings. However, my passion found its way into smaller-scale paintings and, more recently, silk painting. I discovered silk painting rather by accident. A friend of a friend contacted me a few years ago asking if I could help her learn some silk painting. She knew I was an artist but I was mainly working in the medium of fresco (painting in watercolour) at the time. She said she would buy all the necessary materials and I would just have to help her paint to start with. I thought that it would be quite interesting to learn a new technique for me (prior to that, I had not done silk painting), so of course I said yes. And so I actually ended up enjoying silk painting so much that I decided to explore it more seriously and now I only paint on silk. I am quite happy because silk painting technique allows me to work at home, in my own kitchen. Which means I can balance my family and work life better than before. I am really inspired by everyday life, dreams and animals. 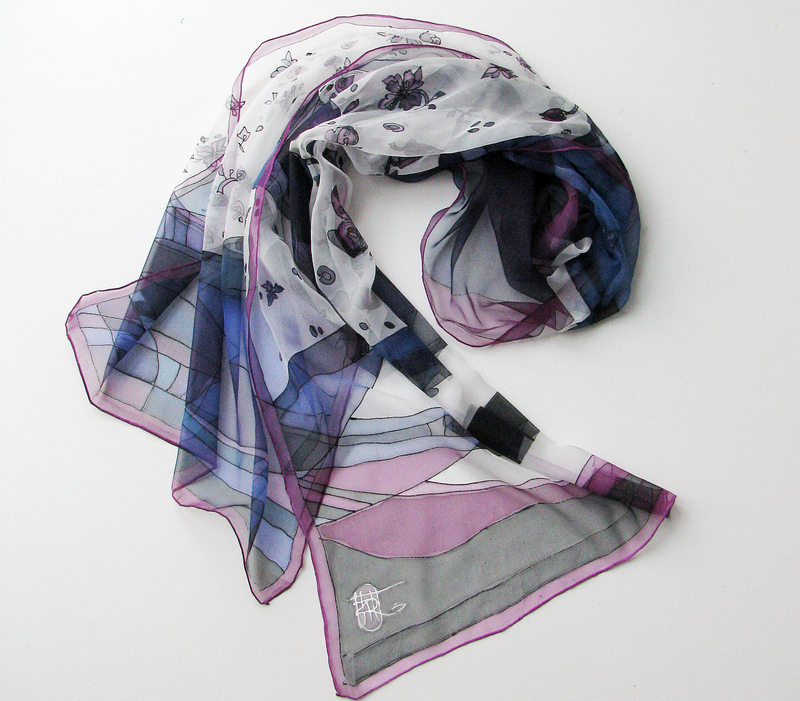 Plants are also very inspiring with their shapes and colours and very often my silk scarves reflect that. I have always loved nature and its natural rhythms and cycles. When I paint, I can feel a certain mood and it usually manifests in a theme of my painting – for example at the moment I am working on spring colour palette and butterfly, bird shapes. 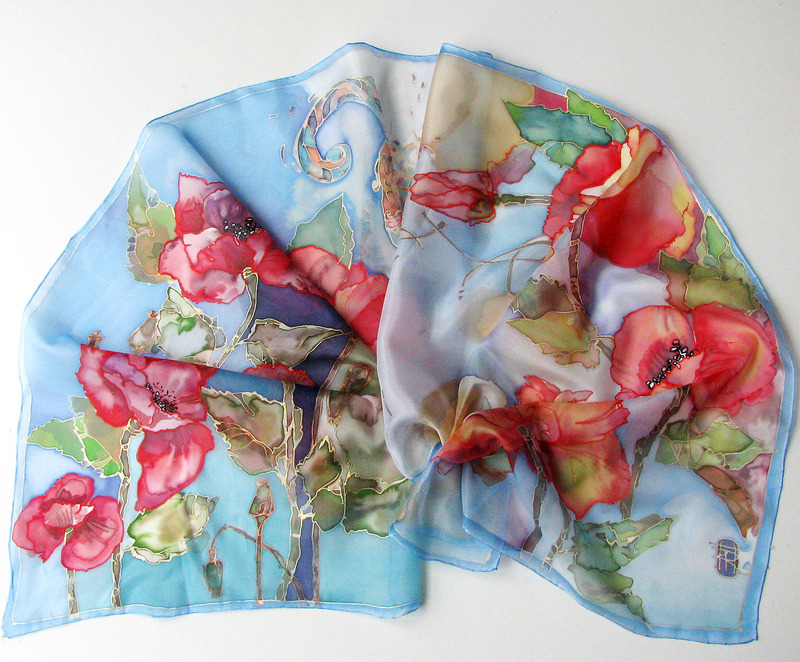 As the nature prepares for new birth, so are my silk paintings reflecting a new season. What is one of your favorite silk painting you have done? 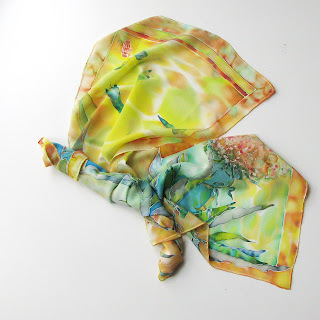 One of my favourite silk paintings I have done is this particular silk scarf called ‘Yellow Floral Motives’. It is my recent work and is available on etsy.com. I really like this piece because it represents vibrant colours of spring and sunshine – something I am really looking forward to after a very long winter. I also think that wearing bright coloured clothes, especially yellow and green, makes me feel refreshed, inspired and energetic. I hope everyone can feel these positive vibes looking at this silk scarf. I particularly love the flowery ornaments and some bright blue showing – like a piece of clear blue summer sky. What are your favorite type of silk, dyes, resist, etc. My favourite types of silk are chiffon and habotai. I love the light, thin texture of chiffon and I enjoy the slightly thicker, smooth surface of habotai. All of my silk I order directly from a silk factory in China. It is where silk originally came from. I usually order larger quantities and it takes a while to receive the parcels, however the quality of the silk is better than buying locally, so it is really worth it. In terms of paint and resist, I use Javana brand. I purchase their products from my local arts shop. How you balance work, life, family and your art? I believe that if you love what you do, you find the way to do it. I have always worked since I had children and I managed to find time to look after them and create art. It is not easy, and sometimes it is actually very hard when your work is at home – it is difficult to find the reason to leave house and get some fresh air and refresh your mind. But it is doable – as long as there is a will, there is a way. How have you found your niche selling online? I do not have any recipes of online selling success – I just do what I like. There is a niche for everyone. There will be a buyer if you sell what you enjoy creating. What is something fun/interesting about yourself that you would like to share with our readers? I have a cat who is quite a large gentleman and he usually is a big inspiration to me. However, sometimes he likes to chew my brushes or drink paint water. There were a couple of times when he actually damaged my silk painting by chewing on it. After that incident we made an agreement that he would behave better. It has been working so far! Please share a tip to help other silk artists or beginners in this art. What I have learned through experience of painting on silk for a few years is that different textures and thickness really make your finished piece convey a different message and thus require different approach. For example, chiffon being very thin, does not require a lot of paint and is really see through – which means that the colours would not be very bright and clear on it, especially held in the daylight or near the window. However, for chiffon silk scarves, the colours would still show when the scarf is tied around the neck or folded (a couple of layers of chiffon really does the trick!). Habotai, on the other hand, is thicker, it is nice and soft. Habotai is very nice to paint on as it absorbs the paint well and the colours stay very intense and bright. Also the silk itself gives a bit of shine, so it looks quite luxurious. I love working on both – chiffon and habotai – but I do different drawings, use different technique of painting and choose certain colours for each type of silk to make sure I get the wanted effect. Another tip I could share with you is that you should wash the silk in cold/warm water before painting. When it is dry, then it will be better to paint on and the colours will be more intense and bright. Usually in the factories silk is covered in a micro layer of glue, which you can wash off before painting to get a nicer finish. Wonderful feature!! I love each one of these beautiful scarves, lovely!! !